To download the font, please visit this website on your pc. As part of 100 years of Lithuania's independence declaration celebration, Lithuanians around the world were asked to sign the online version of the reinstated Independence Act using Signato. This way Lithuania became the country with the largest number of signatories of independence in the world - almost 35 000. If You are one of them, enter your name and surname to find out in which page of Signato book You can find your signature. Signato is very special. While typing, you will notice that it is a much more sophisticated handwritten font than others. Spaces between words will not be perfectly identical, and the same two words when typed next to each will not look the same either, thus giving an impression that the text is actually written by hand. Every letter and numeral of the font has at least several variations. Lowercase letters have different junctions for the beginning, the middle part and the end of the word. Signato also includes combinations of two letters (typographic ligatures) for more diversity in writing. Signato has a total of over 450 Latin, Lithuanian and German characters. 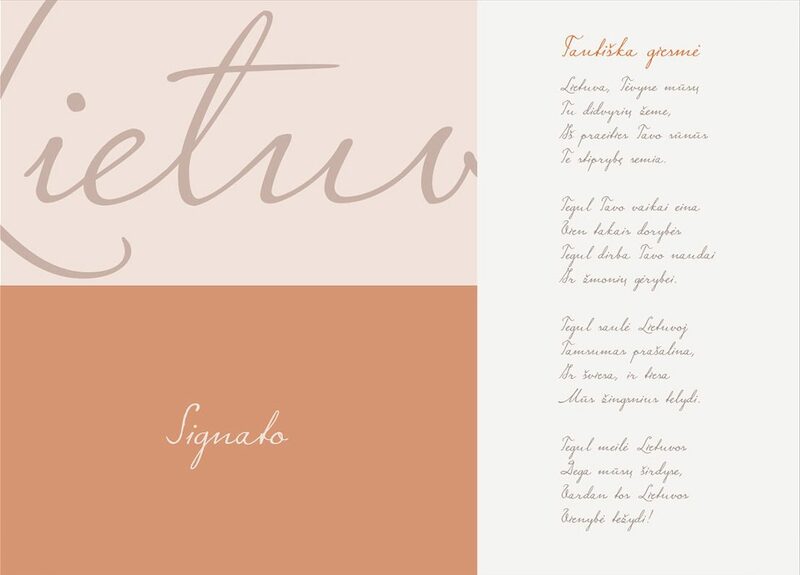 By being precisely imperfect, Signato gives you a realistic impression of a handwritten text. For about 70 years no one had any idea where the Independence Act was, until university professor Liudas Mažylis found its originals in Lithuanian and German on March 29th, 2017. 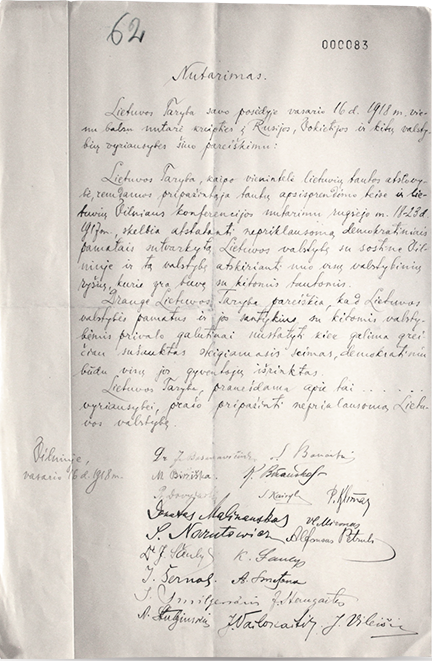 The document of historical significance was secretly signed in Vilnius in 1918, when WW I was drawing to an end. During this time Lithuania experienced a switch between occupations: formerly under Tsarist Russia’s rule for 120 years, Lithuania was at that time occupied by Kaiser German Empire in 1915. This geopolitical situation was taken as an opportunity to restore the Lithuanian state. After Germany lost the war, Lithuania was recognised as a sovereign state. In order to sign the document at the time, the Vilnius Conference had to be convened to elect The Council of Lithuania and to adopt the resolution of February the 16th, today known as the Act of Independence of Lithuania. Both, the political left and right, united and 20 Council members in Vilnius on February the 16th, 1918, declared the restoration of the state, built on the foundations of democratic principles and denouncing any former government ties with foreign nations. Needless to say, the invaders have not just disappeared. After the restoration of independence was announced, Lithuania was still under the German rule. They banned the publishing of the Act and insisted that the Council of Lithuania declare an eternal union with Germany. Luckily for Lithuanians, on November a revolution broke out in Germany and Lithuania was not annexed to it, which led to the final recognition of independent Lithuania. Paradoxically, it was not Lithuanians but Germans who learnt about the announcement of Lithuania’s independence first. The Act of February the 16th was published on February the 18th in the Berlin newspaper Vossische Zeitung. Later on, after German censors interfered, publicising the document was banned not only in Lithuania but in Germany too. Germany did everything possible to discredit the members of the Lithuanian Council and to prevent the establishment of a sovereign state. Only in mid-October of 1918, Berlin finally gave up and granted permission to form the government of Lithuania. It is very simple to use Signato. Just download and install the font alongside the ones you have been using. You will be able to use Signato in all your favourite programs (e.g. MS Word, MS PowerPoint, Keynote). If you have never tried installing a new font in your computer before, read the following short instructions. Download and extract the signato.zip file. In the desktop’s left lower corner press the Start button. Copy and paste the signato.otf font file in the Fonts folder. Find the signato.otf file, most likely the file will be in the download folder. Double-click the file. After the font review program is on, press Install Font. In the Font Book, drag the selected font to Windows Office Compatible so that it is accessible with the Microsoft Office programs. Branding, packaging and user experience agency. We are a consumer-oriented design agency, clearly distinguishing between “I like” & “I need”. Instead of making brands simply beautiful we collaborate with our clients to meet their basic consumer needs. The author of internationally recognized typefaces Neris, Magnel and others. Eimantas continues constructing multilingual typefaces for different languages with OpenType features as a freelancer. Unitary book of centenary signatories will be published soon. Follow the news on Signato Facebook page. Sorry, but we were unable to find your signature. Your signature is recorded as you typed it while signing. Make sure you haven't made any mistakes. Website Users are granted non-exclusive and untransferable right to use the font software for non-commercial purposes. The font software can be installed in the computer ecquipment that is intended for non-commercial use only. Website Users shall not have any right to copy, distribute, change or otherwise use the font software or any updates of the software thereto. All the information available on the Website, including, but not limited to the text, photographs, images, illustrations, logos, icons, audio material, video clips, software and other content is the intellectual property of the Website Administrator. All of this can only be used when viewing the content of the Website. Any other use (copying, modification, distribution or other use) is prohibited. Website Users shall install and use the font software at their sole discretion and be liable for the use of it. The Website Administrator shall not be liable for any hardware failures, software problems or destruction, loss of data or other losses in the computers of Website Users. The rules for the use (hereinafter – Rules) of the SIGNATO website (hereinafter – Website) specify the terms for the use of the Website and the rights and obligations of the users of the Website (hereinafter – Website Users). Each Website User confirms that it has familiarised itself with the terms of the Rules and undertakes to comply with them. The Website is administered by UAB Folkai, reg. No. 303449455, address Gedimino Ave. 27-301, LT-01104 Vilnius (hereinafter – Website Administrator). The Website Administrator shall have the right at any time to unilaterally amend and/or supplement these Rules. The amendments to the Rules shall take effect after their publication on the Website. Font software means the software for generating font. Non-commercial use means any use of the font software for personal needs of the Website Users or their family members, not aimed at direct or indirect financial gain. Website Users are granted non-exclusive and untransferable right to use the font software for non-commercial purposes. The font software can be installed in the computer ecquipment that is intended for non-commercial use only. Website Users shall not have any right to copy, distribute, change or otherwise use the font software or any updates of the software thereto. Share your signature with friends and invite them to join the initiative! Soon, your signature will be inscribed next to other honorable compatriots. At the end of the year, please visit this site or keep following Signato on Facebook to find out on which page you can find your signature!